A cultivar of Prunus avium L. ‘Fruit usually growing singly, very blunt, heart-shaped, nearly round, a little flattened on one side, with a very small suture extending from the stalk to the apex. Stalk about two inches long, slender, deeply inserted. Skin pale yellowish, sprinkled with numerous red spots, with larger patches of dull red or morone on the sunny side. Flesh pale amber, transparent, tender, without any stain of red, adhering slightly to the stone. Juice very sweet and high flavoured. Ripe the middle and end of July.’ [George Lindley – Orchard guide p.151/1831]. ‘Formerly we had but two good pale Cherries, the White-Heart and Bigarreau, both late varieties, and the first a very uncertain bearer. These are now represented among our early kinds by the Elton and Downton, either of which deserves to be classed in the first rank among cherries. The Downton is ripe soon after the May Duke; it bears well as a standard, and in richness of juice it yields to no Cherry of any season. It was raised by Mr. Knight [T. A. Knight at Downton], from a seed either of the Waterloo or Elton, but from which is not certain.’ [PM t.138/1830]. An early season variety. An excellent dessert cherry. 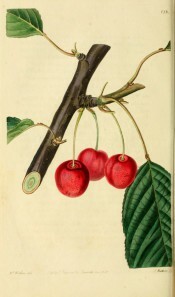 Among cherries recommended by the Gardeners Chronicle. [Gard. Chron. 1852, Grubb]. Listed in an Addendum to the 1857 catalogue only [Cherry no.16/1857].